Mr. Espizona and the students stared in shock at the empty ridgeline. Instead of the slate-colored fieldstone of Gillette Castle, there was blue sky. Norm, who knew the outline of the castle by heart, thought the glaring autumn sky felt empty. The missing castle was like a gap tooth shining in the mouth of a jack o’ lantern. Li-Ming and Thomas glanced sideways at each other, knowing what the other was thinking as only best friends could. How does a whole castle disappear? Murmured whispers spread through the deck of the Becky Thatcher. A sudden crack of thunder silenced them. A lightning bolt flashed out of the river and streaked high up into the sky. 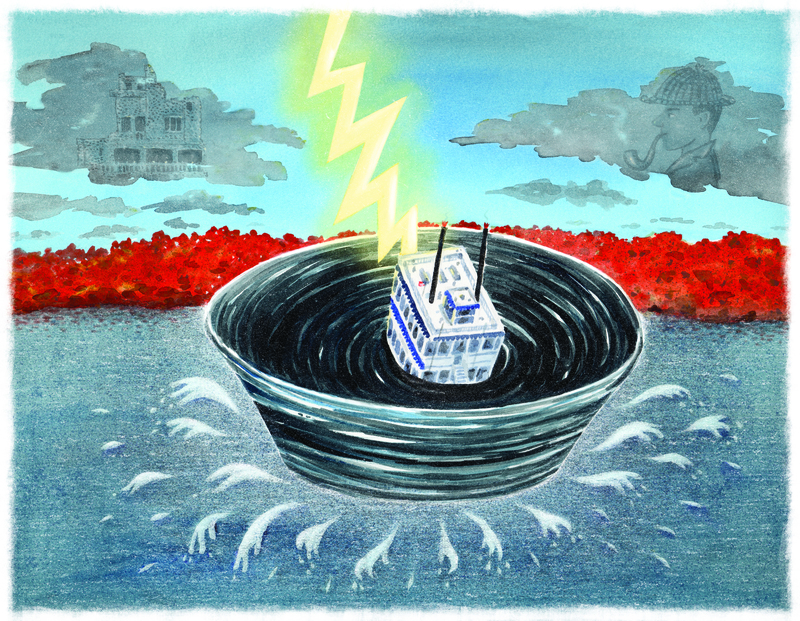 With a loud gurgling, a whirlpool the size of a circus tent opened up in the middle of the Connecticut River. The front of the boat tipped and plunged in. Li-Ming clutched her notebook to her chest. Thomas grabbed her elbow, as much to keep himself upright as to steady her. They circled deeper and deeper into the whirlpool until there was only swirling darkness. There was a loud pop and the boat lurched. A wash of sunlight blinded everyone aboard. The Becky Thatcher had landed on a wide hiking trail in the middle of a forest. Once the shock wore off, it was established that everyone was okay, albeit a little wet. “Another castle,” said Thomas. “Let’s go see it. Maybe there’s a clue about Gillette Castle.” He made his way to the stairs leading off the boat. Li-Ming walked shoulder to shoulder with Thomas as they wound their way around the trail and up the Sleeping Giant. Finally they turned a bend and entered a clearing. In the middle, stood a castle. Norm stared in wonder at the familiar jagged stones that appeared to drip down the castle, like wax melting on a candle. Mr. Espinoza instructed them to huddle in, and the two adults decided that Norm and two students would go in while the rest remained hidden among the trees. “I’ll go,” Li-Ming squeaked out, surprising everyone, including herself. This was the kind of thing Thomas would volunteer them for, but Li-Ming’s eagerness to explore the castle outweighed her fear of speaking up. “I’m in too,” said Thomas. Prepared to defend his right as an aspiring detective, he was surprised when no one else volunteered, not even Miss-know-it-all Samantha. Except for the occasional rustle of leaves under their feet, silence surrounded Norm, Li-Ming, and Thomas as they crept up to a near-hidden entrance at the base of the castle. They slipped in and made it halfway up a stone staircase before voices erupted on the other side of an intricately decorated wooden door. Norm held a finger to his lips. She began to chant in an ancient language. The three eavesdroppers barely had time to ponder the strange, throaty words before a boom of thunder shook the castle. What were you feeling when the boat began to swirl into the Connecticut River whirlpool? Thomas and Li-Ming volunteered to investigate the castle when it landed in Sleeping Giant State Park without knowing what would happen once they got inside. Have you ever volunteered to do something when you didn’t know what would happen next? At the end of the chapter, we are introduced to a character with “an angry Scottish brogue.” What do you think a Scottish brogue is? Where might someone with a Scottish brogue be from?